Sinkholes originate beneath the surface when groundwater moves through the limestone and erodes large voids, or cavities, in the bedrock. When water fills a cavity, it supports the walls and ceiling, but if the water-table drops, the limestone cavity is exposed to further erosional processes that eventually result in the collapse of the cavity, causing a surface indenture, or sinkhole. The sinkhole becomes a primary site of recharge, where surface water can enter the aquifer and replenish the groundwater supply. On the surface, sinkholes may develop progressively as subtle, bowl-shaped depressions, or they may collapse suddenly into steeply sided, water-filled craters. The shape of the sinkhole, and the speed that it forms, depend on the size of the subsurface cavity and the thickness of the overburden (sediments or organic matter that rest on the limestone bedrock). Three general types of sinkholes occur in Florida: collapse, solution, and subsidence. Collapse sinkholes are the most common type in Florida. They happen suddenly where the overburden is thick with soils and heavy clay. Collapse sinkholes are deep, steeply-sided holes in the ground. They are frequently triggered by fluctuations in the water-table. As water levels fluctuate, the roof of the cavity is stressed and weakened. When the water-table drops too far, the cavity walls are unsupported and the ceiling becomes too weak to hold the heavy overburden. Eventually, the ceiling collapses and a sinkhole is formed. A conical debris mound left on the sinkhole floor is all that remains of the cavity ceiling. If the water-table rises, the collapse sinkhole can fill with water, and overflow like a spring. 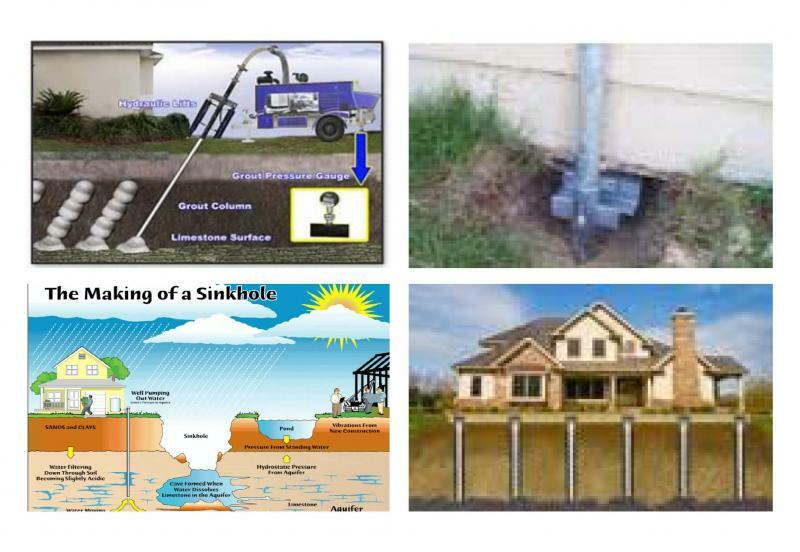 An off-set sinkhole will have an upstream and downstream conduit as water flows into the sink and siphons underground. If the water-table drops below the sinkhole, it will remain dry and accumulate sediments and vegetation. If the overburden is thin or absent, the surface of the limestone bedrock is broken down by erosion from wind and surface water. A bowl-shaped depression, or solution sinkhole, naturally forms slowly and continuously as chemical and physical processes erode the rock. Subsidence sinkholes form gradually where the overburden is thin. The dissolving limestone is replaced by sand granules that fall into the depression and fill the holes. They appear as a concave depression in the ground. Subsidence sinkholes are usually only a few feet in diameter and depth because the development of the cavities in the limestone is retarded since they are filled with clay and sand. As the sediments fill the depression, they restrict the flow of water through the bottom and the hole begins to retain water. As water accumulates, a lake is formed. Many ponds and lakes in Florida are a result of sinkhole formation. The characteristics of a sinkhole lake can give clues as to how it was formed. A circular lake indicates that the lake evolved from a collapse sinkhole. A shallow circular lake results from impermeable sediments washing into a subsidence sinkhole. If a lake rests above groundwater level, it is above a confining bed. Sinkhole formation is aggravated and accelerated by urbanization. Development increases water usage, alters drainage pathways, overloads the ground surface, and redistributes soil. 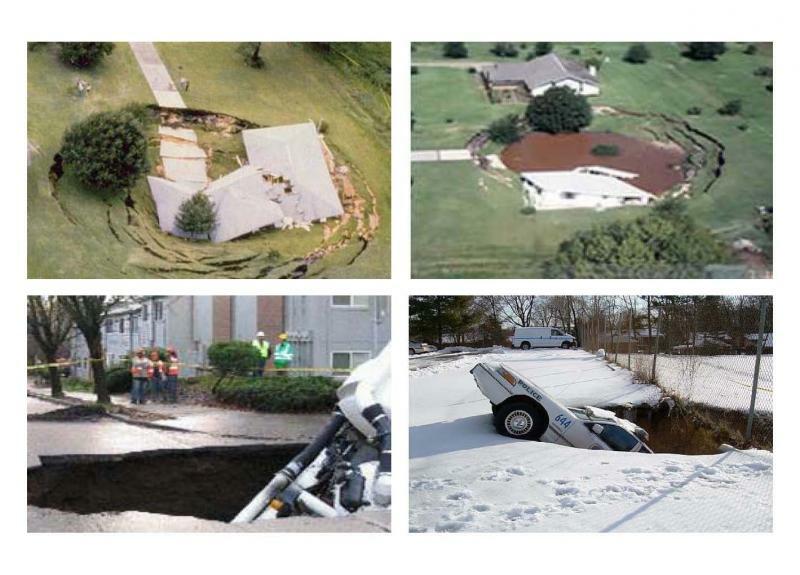 According to the Federal Emergency Management Agency, the number of human-induced sinkholes have doubled since 1930, insurance claims for damages as a result of sinkholes has increased 1200% from 1987 to 1991, costing nearly $100 million. Slumping or falling fencepost, trees, foundations, etc. 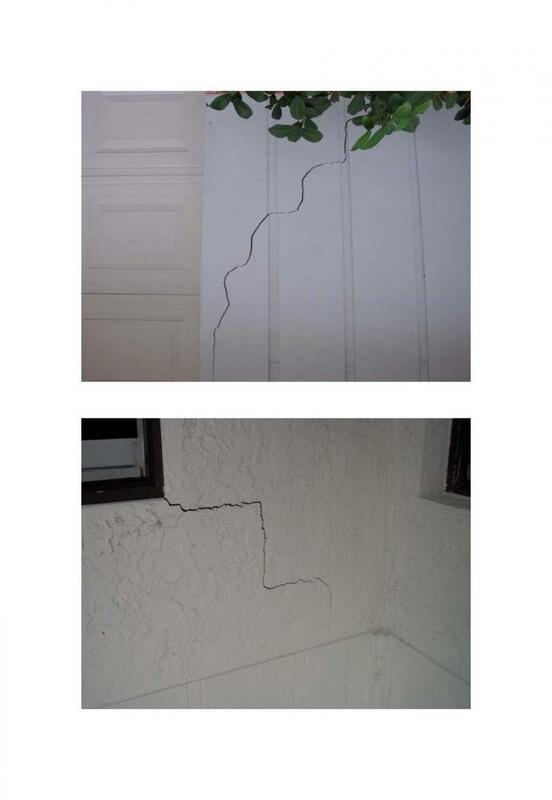 Structural cracks in walls, floors, etc. In addition to providing essential pathways for water to replenish the aquifer, a variety of sinkholes are protected and maintained as Florida state parks where they provide frost-free habitats for cold sensitive species and offer many opportunities for sports and recreation. Areas known to be soil over salt domes See Texas Sinkholes for an example. Cracked earth, a circular pattern of ground cracks outlining the sinking area. Sudden earth cracking should be taken as a very serious sinkhole or earth collapse risk. 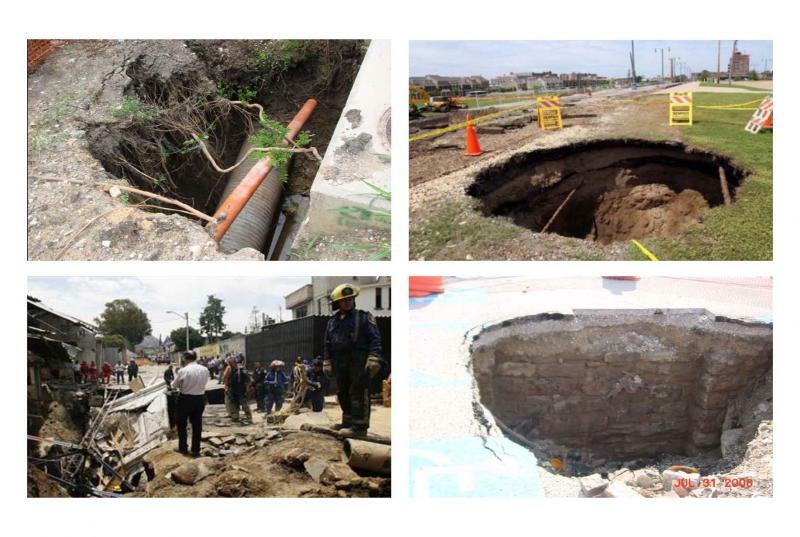 See Texas Sinkholes for an example. Areas of oil drilling where wastewater produced by drilling is pumped back into the ground may cause dissolution of salt domes and lead to local sinkhole collapses See Texas Sinkholes for a possible example. Interrupted electrical or plumbing service to a building or neighborhood due to undermined, settled buried mechanical lines. Silt buildup, fresh mud deposits, muddy water [in wells? in a pond or stream?] 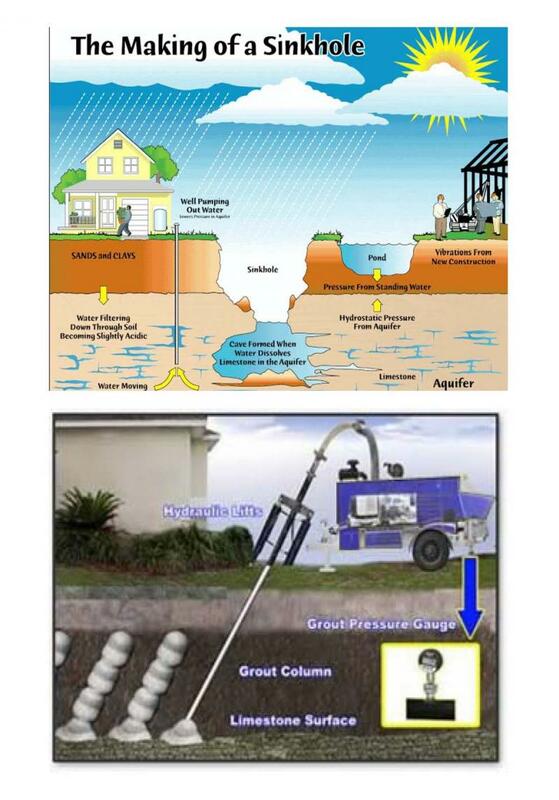 Muddy or cloudy well water from nearby wells can indicate an early stage of sinkhole development. Seismic Refraction: profiles the top-of-rock which may display conical depressions of a type associated with subsidence sinks or deep gouges or cutters which represent sinkhole-prone lineaments. This constitutes an immediate potential safety concern. ASHI Standards require you make appropriate notifications. Sinkhole Warning - How Much Time Do You Have ? BROOKSVILLE, Fla. - Two men were arrested after detectives say they sold homes that once were plagued by sinkholes in Hernando County. Jerrelle Williams was arrested in St. Augustine and William Johns was caught in Texas according to the Hernando County Sheriff's Office. They say the pair bought homes that had sinkhole problems but placed them back on the market at full price without making the necessary repairs. 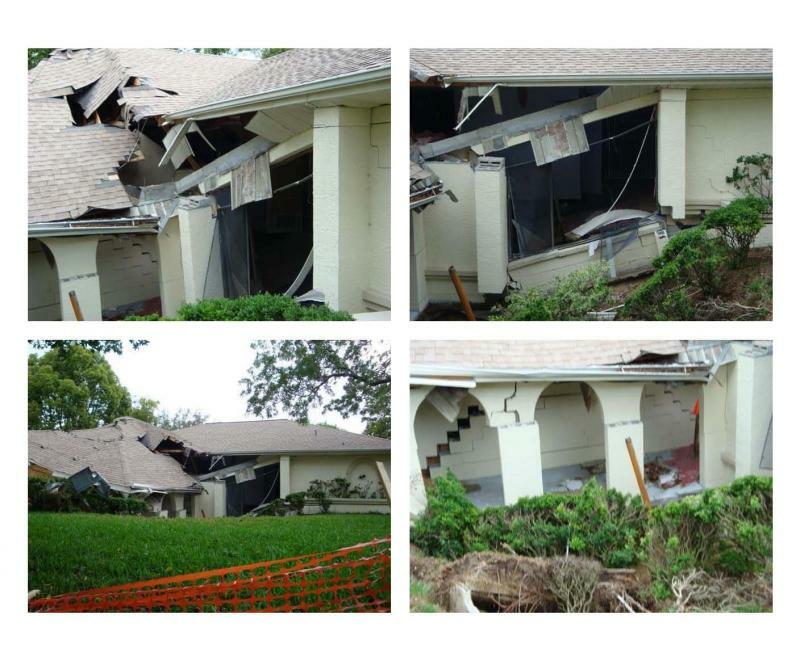 When the new owners found out they had sinkholes they reported the problem to the insurance company. The claims were denied because of a payout to the previous owner for the same problem. Detectives found evidence that they say showed the men had prior knowledge of the sinkholes when they bought the homes and didn't bother to tell the new owners. With the help fo the FBI, the duo were found and arrested awaiting transport to Hernando County to face the fraud charges. Newly appointed Sheriff Nienhuis said his office will remain diligent in fighting this type of crime. "Due to the depressed economy, crimes of this nature have a wide spread affect not only on the victim financially, but on the victim's quality of life. The Hernando County Sheriff's Office will continue to aggressively investigate these types of cases to help protect our citizens," said Sheriff Nienhuis. The three homes netted close to $275,000 in profit according to the sheriff's office.